Choosing the best Dutch oven for your home can be tough. Additionally, there are many factors to consider when looking for a new piece of cookware. So, which Dutch oven is the best choice? Well, it really is subjective. There are visual characteristics to consider as well as size and capacity factors. Furthermore, the material type is also just as important. And one of the best investments you can make for your kitchen is a quality Dutch oven. For this reason, we have put together a handy guide on the most important characteristic to look. And for when you need to decide which Dutch oven is the best choice for you. So, with that said, let’s begin with the must-know factors to aid your search. When searching for which Dutch oven is the best choice, it’s always best to break down the qualities you seek. And an example of some of these qualities is quite simple, yet very important to observe. These factors include; build quality, ease of use, ease of cleanup, maintenance, heat resistant factor, and longevity. If you make sure that your next Dutch oven possesses these qualities you will not go wrong. Additionally, when a Dutch oven earns high marks in each one of these categories, you’ll know it’s a winner. Finally, we will give 3 of our top choices of Dutch ovens in 3 separate categories. So, with that said, we will start with what factors to look for. One of the most important factors to look for in a Dutch oven is build quality. This will make or break any piece of cookware. Furthermore, poorly constructed Dutch ovens will break down faster. Not only that, they can also pose a danger in the kitchen as well. So, what is the best way to choose a durable and well constructed Dutch oven? Well, to start, it may be wise to take a closer look at the materials used. And in our opinion, cast iron is by far the best way to go. Whether it’s plain cast iron or enameled cast iron, you can’t go wrong. Likewise, with cast iron, it will not only last longer but will also cook with more precision and efficiency. You will want to also do some research on the manufacturing process of your next Dutch oven. Additionally, a solid, dry-sand-cast is the better choice. This manufacturing process involves a one piece mold placed in a dry sand base. And this approach ensures that the handles do not need to be welded on afterward because of its one-piece. This not only makes the handles less prone to break off but also ensures a smoother surface which is easier to clean. And the quality of the enamel for coated cast iron cookware is equally important. Likewise, porcelain ceramic is our top choice for enamel material. This material type will not only resist fading and peeling but will also keep their luster longer. The second most important factor is ease of use. This category is very important for many reasons. First of all, a Dutch oven that is lightweight and has sturdy handles has a lot to offer. Not only are they more convenient to use but also safer as well. You’ll also want to look at how fast the Dutch oven heats up. Furthermore, how easy it is to transport, and how well it holds its temperature are also things to consider. Finally, it’s important to note that while lightweight cookware can be convenient, there may be an issue with quality. This is because cast iron and other quality materials are inherently heavier than lesser ones. The third factor to consider is ease of cleanup. This is also very important when considering a new Dutch oven. Furthermore, an easy to clean Dutch oven will more than pay for itself. And let’s be honest, if you have to scrape and scrub, you might have the wrong Dutch oven. The first thing to look for is the nonstick material type. If you like enameled cookware than you need to search for a non-porous extra hard coating. And porcelain ceramic coatings are our preferred choice. These coatings resist damage from acidic foods and will also clean up quite easily. Furthermore, these coatings will allow for easy food release from the cooking surface. Likewise, the time and effort you will save when cleaning will be substantial. As for non-coated cast iron cookware, a well seasoned cooking surface is key. Simply re-season your cookware before each meal with cooking oil and cook to your heart’s content. Additionally, once the seasoning is built up, you will have a high quality, long lasting piece of cookware. How easy a Dutch oven is to maintain is also very important. And thankfully these days most Dutch ovens are manufactured with ease of maintenance in mind. Additionally, if you purchase an enameled Dutch oven, maintenance will only entail cleaning regularly and storing in a dry place. And if you would like more information on cleaning and maintaining enameled cookware, you can click here. Likewise, plain cast iron will need a little more attention to care, but it is well worth it. For non-coated cast iron you will need to regularly re-season your cooking surface, Furthermore, hand drying after washing is essential as air drying can promote surface rust. Simply coat your cast iron cookware with the cooking oil of your choice after washing following every meal. Once a month I like to season my cast iron Dutch oven then place in the oven at 350 to 450 degrees to bake in the oil. This will allow the oil to penetrate deep down into the cooking surface ensuring a solid and near nonstick surface. All of this hard work will surely pay off in as your food will be less prone to stick and burn on the surface. With that said, if you would like to learn more about plain cast iron cookware maintenance. Heat resistance also plays a huge role when choosing a Dutch oven. And when it comes to enameled and non-enameled cookware, the numbers are about even. This is because most non-coated cast iron has a maximum oven temperature of 500 degrees Fahrenheit. While enameled cookware ranges between 400 and 500 degrees. These factors are important when roasting and brazing meats. The higher the temperature threshold, the more options you have when preparing meals. Not to mention, you won’t have to worry yourself with cookware damage from exceeding cooking temperatures. We all want cookware that will last a lifetime. However, how well the item is made as well as how well you maintain the cookware will make all the difference. Thankfully, cookware these days is not only designed to last longer but also can be maintained much easier as well. You will want to also look into warranties offered by the manufacturer whenever possible. Today, most companies offer extended and even lifetime warranties. And while you might never need them, you’ll have peace of mind knowing your cookware is backed up with some kind of guarantee. It would be too difficult for us to choose just one top Dutch oven. This is why we have chosen the best cookware in 3 separate categories. And for the category of an enameled-Dutch oven, we chose the Lodge ec6d43 enameled cast iron Dutch oven. 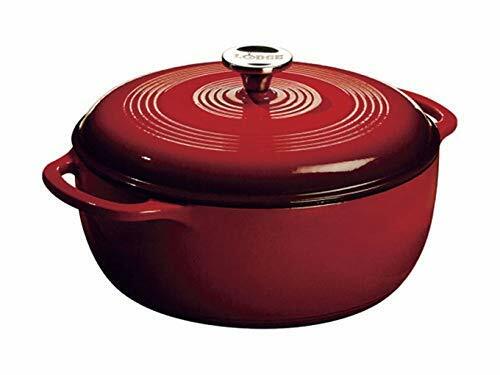 This lodge color enamel 6-quart dutch oven is not only affordable but extremely versatile as well. This is why you can’t go wrong with a Lodge enamel Dutch oven. This Dutch oven offers many convenient features everyone will appreciate. Furthermore, with a large 6-Quart capacity, this Dutch oven will easily serve 4-7 people. And with a 500-degree maximum oven temperature, the sky is the limit for what meals you’ll be able to prepare. This is why we chose it as the best dutch oven for camping. 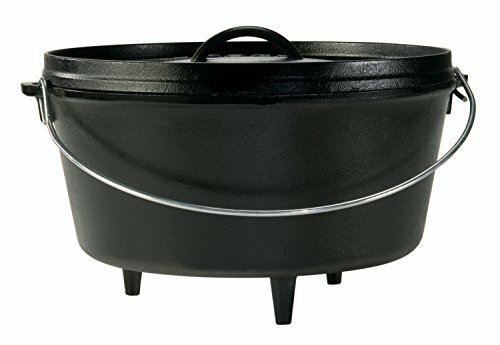 For the non-coated cast iron category, we choose the Lodge L8DD3 Cast Iron Double Dutch Oven. This piece of cookware plays double duty by featuring a lid that doubles as a handy skillet. This will allow for the preparation of 2 meals at once. And with a 500-degree oven temperature, you’ll be able to prepare meals without worrying about cookware damage. This is why among Lodge Dutch ovens, this is one of our favorites. 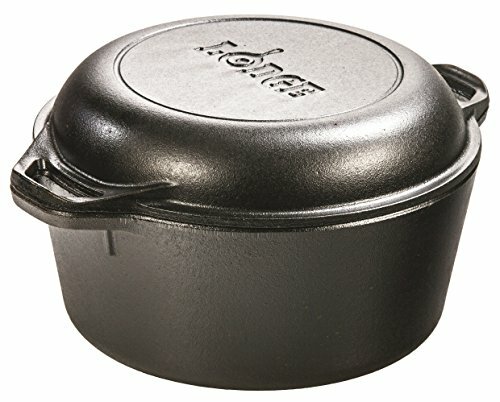 Finally, for our camping category, we chose the Lodge Seasoned Cast Iron Deep Camp Dutch Oven. This product is designed extra deep so you’ll be able to cook more food with less of a footprint. Best of all. this camp Dutch oven can be placed inside fire pits, fireplaces, and campfires. And at 8-Quarts, you can be sure the whole camp troop will be fed with plenty to spare. Well, that concludes our article on Which Dutch Oven Is The Best To Choose? We hope you found this information helpful and actionable. Furthermore, we also hope that you will find your next Dutch oven with diligent research and comparisons. If you are asking the question of what size dutch oven should I buy, we recommend you click here. We would like to thank you for taking the time out of your day to read our article. We hope to see you again in the future and as always please take care.